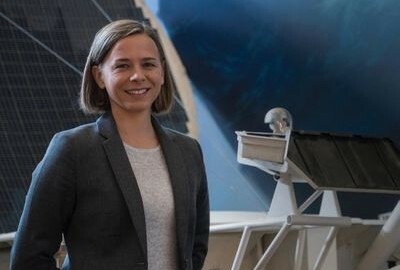 Australia’s first ambassador for Women in STEM, astrophysicist Professor Lisa Harvey-Smith, is to join UNSW as Professor of Practice in Science Communication. UNSW has also been named the host organisation for her Women in STEM ambassador role. Harvey-Smith, an award-winning astrophysicist with 15 years’ experience conducting and publishing fundamental astrophysics research at universities and research institutes, said she was excited to embark on a new challenge after over a decade of research. “After 15 years of conducting research into the mysteries of the universe and developing some of the world’s most technologically advanced astrophysical observatories I am now taking on a new challenge: to help smash barriers to inclusion in STEM and to create a stronger, more inclusive STEM sector fit to drive Australia’s economic success in the coming decades,” Harvey-Smith said. She said her immediate priority would be to help develop and launch Australia’s 10-year plan for Women in STEM, which will provide a roadmap for developing and retaining the talent pipeline that we will need as a nation to embrace the new industries of the 21st century. “I’m delighted to be joining UNSW – which is already engaged in developing diversity of talent and an inclusive culture as a cornerstone of the University’s 2025 strategic plan,” Harvey-Smith said. UNSW’s dean of science, Professor Emma Johnston, said she was thrilled to welcome Lisa Harvey-Smith to the university. “We are proud to welcome Lisa to UNSW as Australia’s first Women in STEM Ambassador – the appointment is crucial for Australia, as we need more women to enter, stay, and succeed in STEM areas,” Johnston said. “One way to work towards that is to ensure girls and women have role models to look up to – and Lisa is an inspiring scientist and communicator.